I’m currently 63 years old and live in Durham, North Carolina. In July 2001, I stopped on the side of the road to help a stranded motorist. I had gone to the back of my car to get a pair of tennis shoes, and an uninsured speeding driver lost control of his vehicle and hit the rear of my car with me in between. After I was hit, I tried to get up and realized what had happened. I instantly became a bilateral above-knee amputee. The paramedics arrived, and I was rushed to the hospital for treatment and surgery. Rods and screws were placed into my two broken femurs, and I couldn’t bear any weight on my legs until the fractures were healed. I also had to wear a back brace for four months for the three spinal fractures I received. I was in intensive care for a week, on the orthopaedic unit as an inpatient for a week, and then transferred to inpatient rehab for two weeks. Within a month of the accident, I was home healing and adjusting. Since all of the bedrooms were on the second floor at our house, some things had to be modified before I could come home. We installed a ramp to the front door and widened the half bathroom doorway downstairs so that I could access it in a wheelchair. 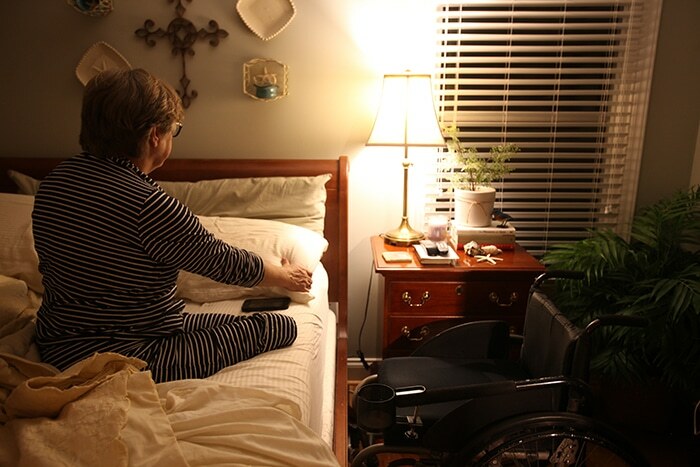 I rented a hospital bed and put it in the family room downstairs until an accessible bedroom and bathroom could be built on the main floor. After the accident, my son and stepson were very supportive and present, and they continue to be now. Unfortunately, my husband at the time wasn’t able to accept the new challenges that came with my injury, so we went our separate ways shortly after I came home from rehab. I tried wearing computerized legs for a few years. I went from being around 5’8″ to 5’11”, and I never felt safe or comfortable. When I went to my first Amputee Coalition of America National Conference in 2004, I saw three other bilateral above-knee amputees for the first time, and two of them were wearing foreshortened prostheses. I came home, scheduled an appointment with my prosthetist, and swapped my C-legs for foreshortened prostheses – or as I call them “platforms”. I went from being 5’11” to the height I was in fourth grade — 4’8” — and I was okay with that. I felt comfortable standing and walking, whether inside, outside, or at work. I’m an older woman now with a lower center of gravity. I do lab work. It’s just safer and easier for me. 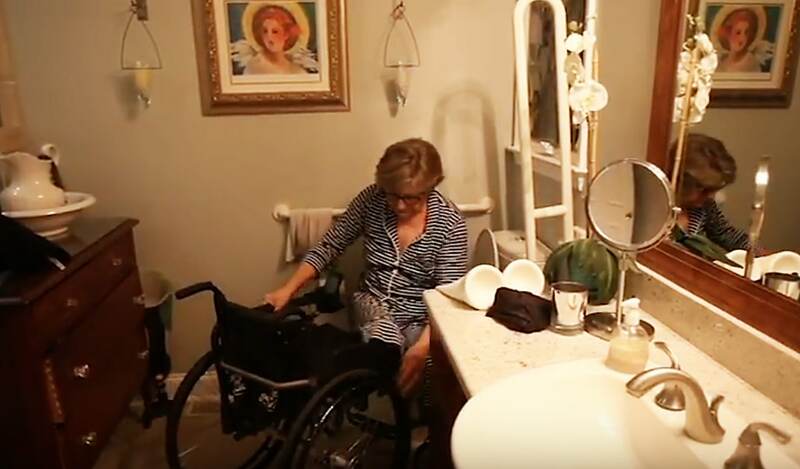 I also use my wheelchair when I’m not wearing my prostheses in the morning or at night, or the combination of both when traveling on a cruise, washing clothes, planting my garden and flowers, and traveling to Washington, DC to visit my Congressional Representatives with AOPA (American Orthotic and Prosthetic Association). I also use my wheelchair if I have skin or socket issues, so I can still get around or go to work. Editor’s Note: Sieber works for the National Institute of Environmental Health Sciences in the Molecular Genomics Core Laboratory. Being a federal employee, I couldn’t have asked for a better place to be. While I was in the hospital getting well, my boss came in and told me, “Focus on getting well. While you’re getting well, we’re modifying the lab, your office, and the bathroom so that they’re accessible when you’re ready to come back to work.” That’s just the best news you can find out. Less than five percent of all amputees return to work. Hearing my boss say that allowed me to have a goal; I was working toward getting back to my occupation. Many people are told by their bosses that they no longer have a job. Imagine that compound effect of knowing that you’re generating a lot of bills in addition to your family’s monthly expenses — just imagine that negative impact — whereas I had that positive impact of a goal of going back to work. Five months after my accident, I was working part-time from home. With the help of my “friend/neighbor/coworker” driving me, I transitioned to half days at the office while still doing outpatient physical therapy three times a week. Many employees donated their time off to me when all of my sick and vacation time had been exhausted. Their donations of time enabled me to still get my paycheck. Those are large gifts, and all I can say is thank you. I’m an Amputee Coalition Certified Peer Visitor as well as a Certified Peer Visitor Trainer. I visit other amputees as requested, whether it’s in person, on the phone, or by email. I also train other amputees and caregivers to be peer visitors. We try to listen, encourage, and answer questions for new amputees or people facing amputation. When I peer visit, people sometimes ask about relationships. I think it’s good for new amputees to hear from another amputee the possibilities of how something like disease or amputation can affect a family; either the relationships will become better than you ever imagined, or they will end more quickly than they were going to anyway. You can never predict how other people will react and respond to a traumatic situation. If an amputee gets to see another amputee before they’re discharged from the hospital, that is a huge plus in their recovery. They hear what the medical staff are saying, but seeing another person on the other side of that healing process gives them great hope. That’s why, with peer visits, we try as best as we can to match people. If we can match age, gender, race, cause of amputation, and level of amputation, it’s amazing how that can help give someone hope of where they can progress to. However, you have to do peer visits in small bites. After amputation, like any other major surgery, you could be groggy from medications or in a lot of pain, so the things that you might say at a peer visit might not all sink in or be remembered. Encouraging people to go to a support group is another way of hearing that same information at a different time and place, and then you’re able to support one another, answer questions, or problem solve together. 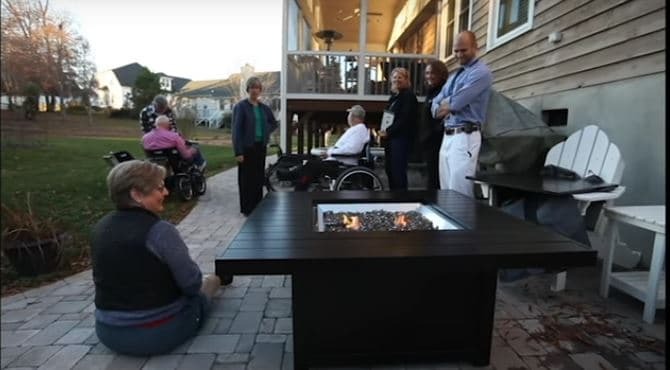 You might hear of a resource for a contractor or carpenter that really understands accessibility modifications, or someone might tell you about a great wheelchair. A couple years ago, I co-presented a wheelchair session at our Amputee Coalition National Conference. It was very well received because not all amputees can or will choose prostheses. For those of us bilateral above-knee amputees that do use prostheses, we still need a good wheelchair for when we’re not wearing them. 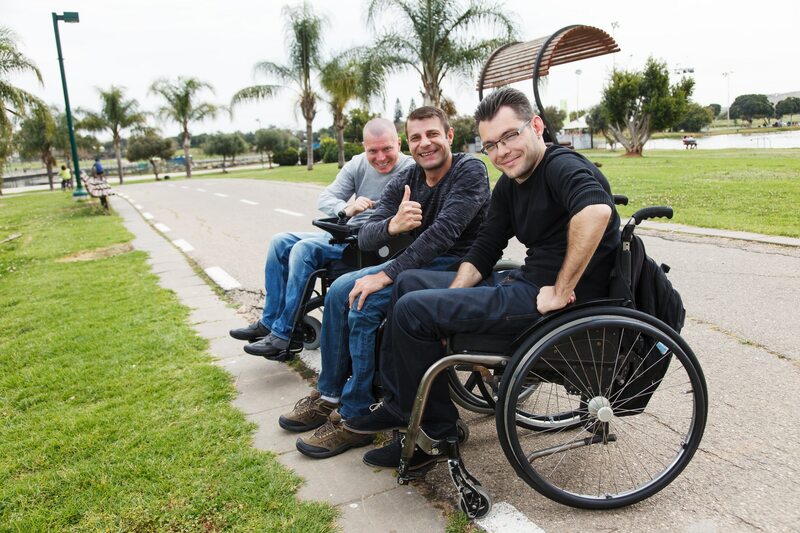 It’s important to get a good wheelchair that’s going to last and to understand what the insurance options are, and this is the kind of information you can share with fellow members of a support group. Spouses, caregivers and partners can also benefit from information and the encouraging environment of a support group. 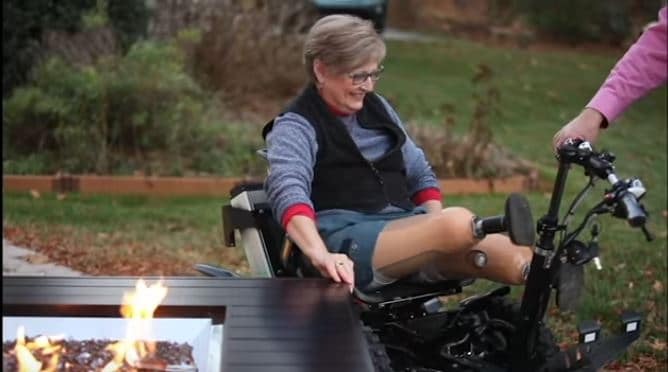 Amputation affects all of us in a family. Editor’s Note: To learn more about the Peer Visitor Program and find support in your area, visit the Amputee Coalition’s website. 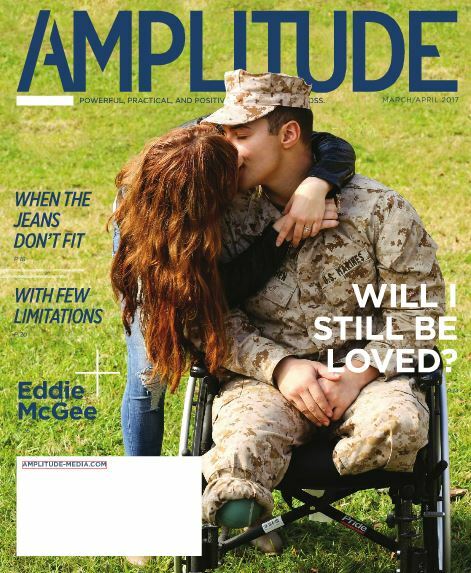 Amplitude Magazine was not in publication at the time of my accident, but the editor, Rick Bowers, had worked for the Amputee Coalition of America for their magazine, inMotion. He and I stayed in touch, because he had written a few inMotion articles we had worked on or I was featured in. He contacted me when he got started with Amplitude. It’s a quality magazine and certainly a good, printed resource to put in the hands of amputees. Part of peer visiting is educating and encouraging new amputees and getting them the resources they need to be the best advocate they can be for themselves. Other quality resources we give out include publications from the Amputee Coalition: Insurance Coverage and Reimbursement Guide, First Step, InMotion, and Beginning Your New Journey booklets. The big thing as a person with limb loss is that we learn to roll with or adjust to things on a daily basis. Since we have to deal with getting around in places where things are not always accessible, or skin issues, or something else, every day is not going to be just get-up-and-go. That mentality is helpful for a lot of other things that happen in life. 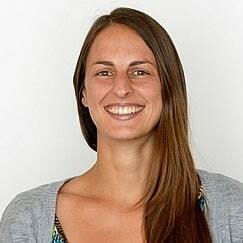 Editor’s Note: Stella Sieber is also involved in a project advocating for insurance fairness for amputees. You can learn more about it and see how Sieber uses both her prostheses and wheelchair by watching this video about her on www.insurancefairness.org.